Heavy duty truck leader Kenworth is set to launch a major update of its conventional (bonneted) cabs. The change will involve a single 1460mm cab for the T359, T403, T409, 409SAR, T609, T659, T909 and C509. The C540 off-road mining model and the similar C510 will be excluded from the changes. The new common cab will involve an all new interior and dash layout, reinforced pillars and improved drivers’ field of vision. "Kenworth is pleased to announce an upgrade to the conventional cab range, which will see the introduction of an all new interior and the strongest Kenworth cab to date," a memo obtained by ATN says. Dated February 26, the memo is addressed to Kenworth dealer principals, sales managers and sales reps.
"Conventional trucks coming offline as of June 2nd 2014 will receive the new cab," it says. "This update will comprise an interior upgrade and a larger cabin in a T359, T659 and C509. 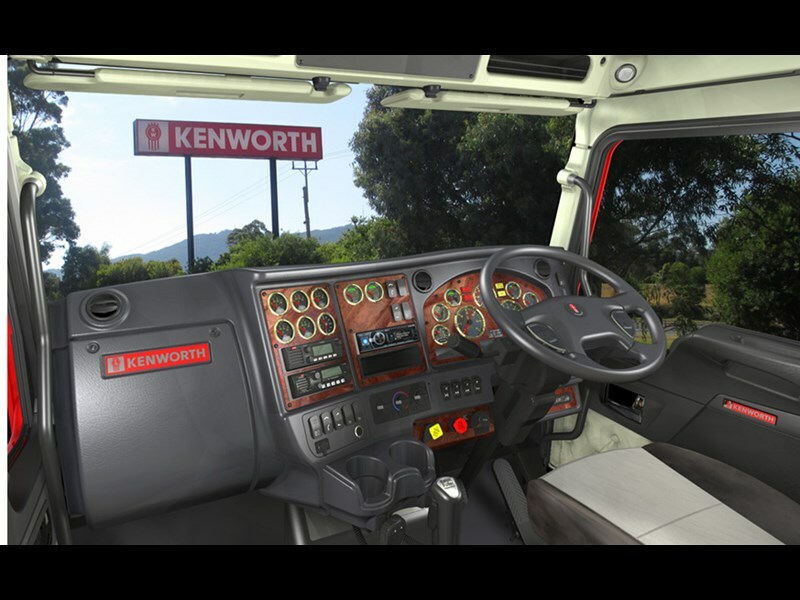 "Kenworth currently offers 3 cab variations and the Cab and Interior Upgrade project will simplify this to a single variant. "All changes were made to create a more refined product whilst improving driver appeal. Everything about this new and improved cabin says you’re sitting in a Kenworth." The 1460 mm cab will feature a fibreglass engine enclosure, high roof and curved windscreen. The updated cab structure will involve reinforced A and B pillars, an updated firewall including integrated cab cross-member and a single piece steering column mount. A new common interior and "ergonomic dash layout" will replace the current curved and flat dash variants. "The main dash will feature all the gauges, switches, radios and warning clusters in a new, optimized layout," the memo states. Both primary and secondary controls will be situated within easy reach of the driver, and a "Smartwheel" steering wheel will have fingertip controls for crucial functions. Meanwhile the overhead console will have all electronic equipment relocated to the main dashboard. Advantages of this are said to include "no distractions from overhead lights at night", "allowing [the] driver to keep their eyes on the road", and "increased overhead storage space". Easier circuit protection access, with a removable dash section. The memo says the 1460mm cab for the Kenworth T359, T659 and C509 will add 100mm to their current front-axle to back-of-cab dimension. This will allow additional seat travel in these models, but it will also add some weight. "In having the bigger cab and combining the structural and interior changes we are expecting to see an increase in weight of roughly 30kg," the memo says. "Once official weights have been confirmed more details will be sent out." A Kenworth spokesman told us that the company will be issuing an official press release on the cab update soon. Find Kenworth trucks for sale. Search for new Kenworth specs.